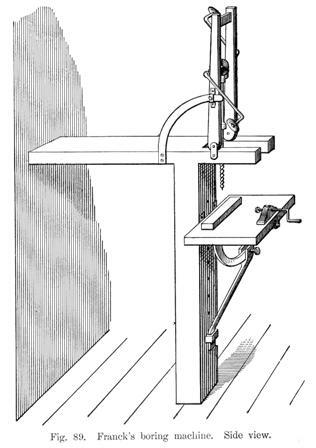 I bought a carpenter�s boring machine. I took the seat off, set a post up in the shop, spiked a piece of wood, two by eight feet, on the top, letting it project over about twelve inches, and, reversing the machine, bolted it on this piece. I then made a table that could be tilted, and that had blocks and screws for holding work. I fitted spoke augers into the chuck, and held the wheel firmly by means of a rod extending through the hub. Fig. 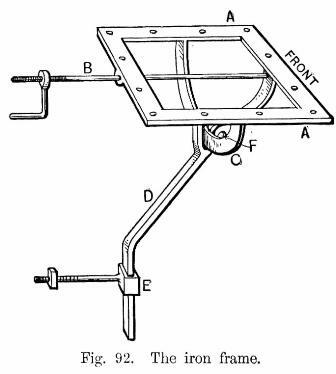 89 is a side view of the machine and table. Fig. 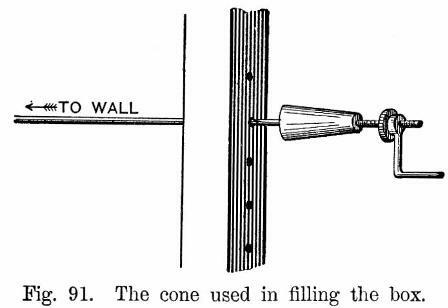 90 is a front view, showing the way in which it cuts spoke tenons. Fig. 91 shows a small wooden cone I use to fill the box in the hub. Fig. 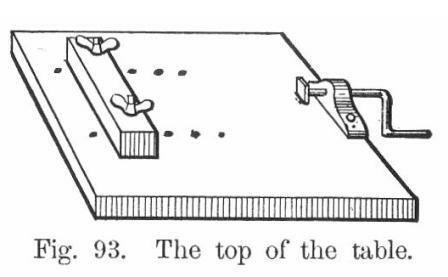 92 represents the iron frame on which the table is bolted, A being the table, B the rod to secure it, C the circle, D the brace, F the slot for the lower ends of the brace, and F the thrust screw, which fastens into a piece of iron that is welded to the brace. Fig. 93 represents the top of the table. The machine should be set high enough to get a strong downward pressure in operating it.�By C. FRANCK.